While tension may be mounting in many cities as just a day is left for the delivery of verdict in the 60-year-old Ram Janmabhoomi-Babri Masjid case by the Allahabad High Court’s special three-judge Bench, in the pilgrim city of Haridwar the situation is quite normal. Though the Uttarakhand government will start a dedicated university catering to preservation and spread of hill culture, yet the main mode of audio-visual communication — feature films and video albums — being churned out these days in large numbers from the Garhwal-Kumaon regions seem to be influenced by Bollywood or Western films. 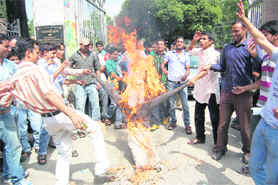 Uttarakhand Technical University (UTU) is again surrounded by controversies for admissions to BEd course. The allegations are levied on the university by applicants falling in the SC/ST category for cancelling their admissions after clearing entrance examinations held way back prior to this month. To welcome the new batch of students, Beehive College, Selaqui, organised a freshers’ party here today. The event was jointly organised by the Beehive College of Management and Technology, Beehive College of Advance Studies and Beehive College of Engineering and Technology. A freshers’ party under way at Beehive College in Dehradun on Wednesday. Yadavindra Public School (YPS), Mohali, has lifted the All-India Public Schools Conference Inter-School Squash Tournament. The final day of the tournament organised at the Rashtriya Indian Military College (RIMC) saw some intensely contested matches played among teams reaching the semifinals and finally the final match. Yadavindra Public School, Mohali, with the trophy of the All-India Public Schools Conference Inter-School Squash Tournament in Dehradun on Wednesday. Host Guru Nanak Academy got the better of St Jude’s School in a quarterfinal match of the ongoing Inter Council School Sub-Junior Boys’ Football Tournament here today. Sidharth Gurung (seventh and 11th minutes) and Sarvnam (42nd) scored for the host team. Tenzin (22nd) netted the only goal of the losing side. The match ended with the score 3-1. Pramod of Government Inter College, Bhagwanpur, emerged winner in the 800m boys’ (seniors) race during the sports and athletics competition held at Shri Guru Ram Rai Inter College, Nehrugram. Three matches scheduled to be played today during the Bar Association Carrom Tournament couldn’t be completed. While tension may be mounting in many cities as just a day is left for the delivery of verdict in the 60-year-old Ram Janmabhoomi-Babri Masjid case by the Allahabad High Court’s special three-judge Bench, in the pilgrim city of Haridwar the situation is quite normal. However, a flag march by the state police, aided by paramilitary personnel, was carried out here in the evening as a precautionary measure. Several organisations, irrespective of their affiliations to various Hindu and Muslim sects, and other social organisations are urging all and sundry to respect the decision of the High Court Bench and not fuel any tension which would hurt the centuries-old communal harmony of the world renowned Haridwar city. A peace march was taken out by the Gandhivadi Ekta Manch in view of the historic verdict, urging people for peace and patience. 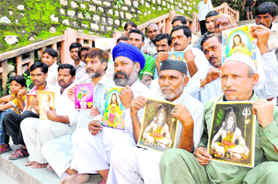 The activists of the manch carried photographs of gods to convey the message that all human beings may differ on religion, caste or creed but the God is one. So, there should be no place for communal disharmony and one should respect one another’s religion. Muslims, Hindus, Christians, Jains and Sikhs conveyed the message of love and peace on the holy Ganga ghats. Chiefs of Hindu, Muslim and other religious organisations urged the residents of the city for restraint and maintaining peace after the court judgment is delivered. Meanwhile, an alert has already been sounded in the whole district while Section 144, IPC, has been enforced from today till the next order. The gathering of more than four persons will not be allowed while stringent security measures are being taken in the district that has a sizable population of both Hindus and Muslims. Senior Superintendent of Police Sanjay Gunjiyal said at all shrines and sensitive places elaborate security arrangements had been made to thwart any attempt by mischievous persons to break law and order situation. District Magistrate R Meenakshi Sundaram has announced a school holiday for two days as a precautionary step. Dehradun: Besides comprehensive security arrangements, Section 144 has been imposed in four sensitive districts of Uttarakhand in view tomorrow’s verdict by the Allahabad High Court in the Ayodhya case. The verdict is scheduled to be pronounced at 3:30 pm on Thursday. Section 144 has been imposed in state capital Dehradun, Haridwar, Udham Singh Nagar and Nainital as the four districts have been identified as sensitive. In some pockets of Pauri district also the section has been imposed due its proximity to the border of Bijnore district of UP which has a large Muslim population. The section prohibits forming unlawful assembly armed with deadly weapons. These places have been identified as sensitive owing to a mixed state of population there while no such danger is being felt where either Hindu or Muslim communities live. The police authorities are cautious for Dehradun considering 18 cases of communal violence here in 1992 in the aftermath of the demolition of the Babri Masjid, highly placed police sources said. Though the security cover was elaborate in Uttar Pradesh, apprehensions are there that some may try to disturb communal harmony in neighbouring states and places like Haridwar could be the easy targets for them to create trouble, police sources added. Police officers said the force was ready to deal with any untoward incident that may occur in the aftermath of the court’s verdict. State Director-General of Police (DGP) Jyoti Swaroop Pandey, while talking to The Tribune, said: “The security has been beefed up in the state and the sensitive places are under the strict vigil of the police. Twelve companies of the Police Armed Constabulary (PAC) have been deployed in the Garhwal region and eight in the Kumaon region”. At the places, where a large number of Hindu and Muslim communities reside, the police has conducted awareness drives with regard to the Ayodhya case. The cops have also held talks with leaders of various communities, asking them to follow restraint and cooperate with the police in the aftermath of the verdict, the DGP further said. With the pronouncement of the verdict scheduled for tomorrow, rumours have also started doing rounds. “Anybody found spreading rumours will be taken to task. 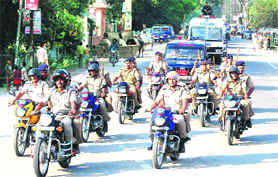 In this context, the police will first do the verification and then initiate action,” Pandey added. Even yesterday after the announcement of the rejection of Ayodhya title suit verdict deferment plea by the Supreme Court, a high alert was sounded in the state and the security was beefed up. Nainital: The district administration has imposed a ban on the unlawful assembly in all eight blocks of Nainital by implementing Section 144. District Magistrate Shailesh Bagauli has prohibited assembly of five or more persons at a public place. There is also a prohibition on public meetings, processions and carrying of arms at a public place. The administration and the police claimed to have taken all precautionary measures to prevent any incident of communal flareup in the district. Recently meetings were organised in which representatives of all communities participated and it was decided to maintain communal amity at all costs. Officials have been appealing to people not to pay heed to any rumour. They have been even sending SMSes in this regard. Of the 11 Provincial Armed Constabulary (PAC) battalions available in the Kumaon region, five each have been deployed in Udham Singh Nagar and Nainital districts, while one has been deployed for the remaining four hill districts. Dehradun: A day before the verdict in the Ram Janmabhoomi-Babri Masjid case is to delivered by the Lucknow bench of the Allahabad High Court on Thursday, various political parties in the state have come together to appeal to the people of the state to observe peace and communal harmony in such a testing and sensitive time. State president of the Samajwadi Party Vinod Barthwal, at a press conference, said his party would welcome the verdict whatever it may be, and emphasised that this day should not be observed as a “Shame Day” or “Proud Day” by any political party. Appreciating country’s diverse and multi-caste structure, he said we all needed to accept the reality and if we did not do so, the country would get weakened. Secretary of the Uttarakhand State Committee of the Communist Party of India (Marxist) Vijay Rawat said the public should remain cut off from the separatist elements who could fan communal violence on this occasion. President of the City Congress Committee Harish Virmani said they requested all political parties, activists and people of India to regard the court’s decision and if anybody had a reservation about the decision, they always had an opportunity to file an appeal in the Supreme Court. He added that the entire world was watching us closely, and we required to set an ideal example by sticking together in this difficult period. Manoj Dhayani, state spokesperson of the Nationalist Congress Party, said the public should be alert enough to thwart any attempt of anti-national elements to spread violence and should therefore contact the police, administration or their office in such a scenario. The Uttarakhand Andolankari Sanyukt Manch too expressed similar sentiments urging people to exemplify unity and solidarity on Thursday. The All-India Hindu Personal Law Board too have requested people to take the verdict as another series of legal process, not a completion in itself, which could be challenged in the Supreme Court. He appreciated Prime Minister’s appeal to the public and said it was very natural for the administration to be concerned over this issues, as the historical matter of Ayodhya was related to the sentiments of people. 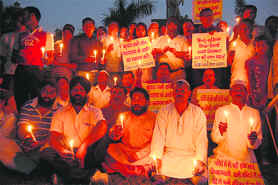 Meanwhile, members of the Punjabi Sangathan, Uttarakhand, lit candles before the statue of Mahatma Gandhi and appealed to people of the state to maintain calm and peace on the day of verdict on the Ayodhya issue. Speakers collectively sent across the message that people of the democratic country of India had faith in the authority of the judicial system of the country and were ready to abide by its decision on the matter. The ones who spoke included chief patron Vijay Singh Chauhan, state president Devender Singh Sethi, city president Vijay Bhagga and Vivekanad Khanduri. Dehradun: Uttarakhand Governor Margaret Alva has appealed to the people of the state to maintain peace and harmony after the Allahabad High Court judgment in the Ram Janmabhumi-Babri Masjid case on September 30. The Governor said: “Our greatest asset is our diversity. Let us take the pledge to maintain peace and harmony after the verdict is delivered. Whatever may be the judgment, the aggrieved party has the opportunity to go in appeal to the Supreme Court”. The Governor said the Centre had shouldered its onerous responsibility in sensitising the state governments on the matter. “Cutting across party lines, it is now the duty of all leaders and the people to maintain peace. The administration will be alert and is prepared to ensure law and order. God bless us all,” she added. Several traditionalists are hurt by this trend as first, these do not portray the real hill culture and secondly, these present a negative image of the glorious hill culture and traditions. Many veteran film makers, who were involved in the ’80s and early ’90s in Garhwali film productions, have now moved on to theatre to bring back to life the real culture, history, traditions and art of Uttarakhand. One such person is Vishal Naithani, who scripted mega box-office hits like “Kauthik” (1986), “Chakrachaal” (’93), “Beti-Bwari” (’88) to name a few. He was also the assistant director in these films that are considered milestone movies in Garhwali silver screen history. In the late ’90s, Naithani switched from mainstream regional cinema to theatrical presentations without comprising on his ethics and art. 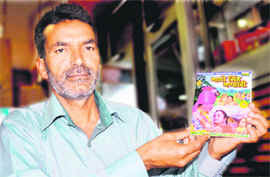 All his ballet presentations are in Garhwali language. In an exclusive chat with The Tribune, Naithani deplored the present generation of Uttarakhandi filmmakers, who concentrate on the easy way of making money and have no regard for the culture of the hill state which attracts national as well as international filmmakers. Elaborating on this, he said, “Raj Kapoor, the biggest showman of Indian cinema, portrayed hill life, culture, heritage and locations much better than these local filmmakers in ‘Ram Teri Ganga Maili’. Subhash Ghai did so in ‘Kisna’. Now Naithani is totally dedicated to theatre and has been presenting Garhwali-based theatrical presentations and ballets in various parts of the country. Just after this interview, Naithani, accompanied by two team members Raghunath Rawat and Meena Bhatt, left for Dubai to perform a ballet based on legendary Madho Singh Bhandari’s life. Scheduled to be held at Sheikh Rashid Auditorium on October 18, this musical performance will take Uttarakhandis in the Gulf region through to the tale and achievements of Madho Singh. The trio will be also training and directing other artistes for the presentation. The performance is part of KESS-2010 fest that is being organised by the Uttaranchal Association of Emirates. The performance will be replicated in Oman and New Zealand. 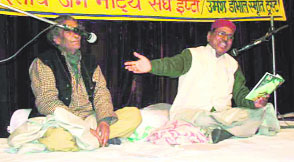 Lashing at several singers like Preetam Samrat who is also known as Jaagar Samrat, Naithani remarked, “Preetam is hosting a talent hunt singing show on a news channel, but he doesn’t have full command over various singing aspects. “How can the new crop of singers follow the footsteps of legendary Gopal Babu Goswami and Narendra Singh Negi?” rued Naithani who has also directed a commercially successful video album on Madho Singh Bhandari by the same name. He added that a healthy entertainment needed to be provided. “We don’t have a dearth of good themes or talent, but every art needs hard work and perseverance. A good product can’t be achieved when one is at the producer, director and hero of the film and puts his relatives before talented artistes. Signing off, Naithani remarked, “If our culture is loved in Mumbai, Chandigarh, Delhi, Emirates, Oman, New Zealand, the USA, England, Malaysia, then why are we not giving it due respect in Pauri, Tehri, Uttarkashi, Dehradun, Almora, Nainital?” leaving a question for filmmakers and audiences of the state to ponder over the next time they watch a music video or film. However, in this regard, students at DAV PG College held a protest and burnt an effigy of UTU Registrar CS Mehta on the premises of DAV College here today. 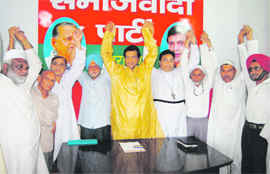 Former general secretary of DAV Anil Tomar, along with his supporters, held the protest. They shouted slogans and gave memorandum to the Registrar pressing their demands on the UTU administration. Accusing the management of the university, Mahinder Pal Rana (Mahi) of Aryan group said the university had withdrawn the admissions of SC/ST students below 45 per cent marks in their graduation regarding them non-eligible for the course. “But the advertisements released in newspapers by the institution required minimum marks of 40 per cent as the eligibility of the course. The students are feeling deceived by the misleading advertisement released by the university,” he alleged. Denying the allegations of the applicants, Mehta said, “The allegations are entirely incorrect. The advertisement released by the university clearly mentioned 50 per cent minimum marks for general candidates and 45 per cent minimum marks for the SC/ST candidates as the eligibility criteria to appear in the entrance examination. BEd admissions are cancelled for the candidates not falling under the due set up standards of the qualifications”. “The technical university is not doing injustice to the students, but is following the government recommendations appropriately. The fee structure for the BEd course is yet to be framed by the university, while the further process of the admissions will begin by the end of October,” he asserted. Chairman of the college Amit Kapoor inaugurated the programme with lighting of the lamp followed by expressing his views emphasising on the importance of education. Kapoor stressed upon the importance of extra-curricular activities apart from the academics as it would not only enhance the individual’s personality, but also help the scholars to build a better society. Khalid Hasan, Dean, Academics, talked about college’s mission of providing quality education which would result in the development of the scholars and responsible human beings. The programme progressed with colourful cultural programme performed by students of II and III year. A contest for selecting Mr and Miss Fresher was also conducted, where Muneshwar Ram and Anu Raghuvanshi were crowned as Mr and Ms Fresher for the Beehive College of Management and Technology. The award for Mr and Ms Fresher for the Beehive College of Engineering and Technology went to Atul and Mona while Anshul and Ritu Arora were crowned as Mr and Ms Fresher for the Beehive College of Advance Studies. The cultural events commenced with the chants of Goddess Saraswati presented by students of the Department of Education followed by a dance performance by students of physiotherapy. Shrey Verma and Umang Arora of BTech kept the audience spellbound by their dance performances. Apart from this, Ankur and Nitish from the Management Department performed a sizzling group dance followed by a Garhwali song “Surma Sarala” by BEd students. Dr Mahaveer Singh, Director, Beehive College of Engineering and Technology, addressed the students and wished them a prosperous future ahead. In the first semifinal match played in the morning session, Modern School from New Delhi lost to Yadavindra Public School, Mohali. In the second semifinal, Mayo College, Ajmer, defeated the RIMC after a close contest which was a treat for the spectators. In the evening, Mayo College took on YPS, Mohali, for the trophy. After some wonderful display of grit and on-court resilience by all six players, it was YPS, Mohali, that emerged victorious. The results of the final match were as under: Ameek Singh (YPS) lost to Utkarsh Kumar (Mayo) 1-3; Taramdeep (YPS) defeated Arjun Budhiraj (Mayo) 3-2; Ranvijay (YPS) defeated Vatsal (Mayo) 3-2. The chief guest for the evening session was Brig Prithi Singh, Commander 42 Inf Brigade. In his address to the gathering, he reminisced about his past association with the Doon valley at large, and the RIMC in particular. He commended all players, mentioning that all of them were going back as winners. Col PK Kumaria, Comdt, RIMC, presented the college memento to the chief guest, thanking him for his presence. In his vote of thanks, the Commandant appreciated the efforts of all individuals who were responsible for making the event an organisational success. He went on to praise all contestants for an excellent display of sportsmanship and enthusiastic participation that was evident through the tournament. Other dignitaries present were Lieut-Col Rajesh Nathawat, Wg Cdr SK Thapliyal and Maj SR Sahoo. 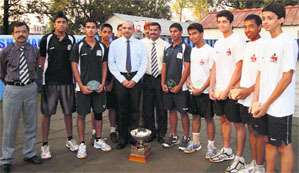 The co-ordinators for the event were Birjesh Chauhan, Dean of Sports, and Balbir Chauhan, in charge for squash. St Joseph Academy beat Marshall School 2-0. The two important goals were scored by Archit Uniyal (14th and 40th minutes). In another quarterfinal match, MIS registered easy 3-0 win over Carman School, Premnagar. Dechan (15th), Aditya (28th) and Akash Prakash (44th) scored in the victory of MIS victory. Col Brown School beat Doon Public School 2-1. Gaurav Dewal (12th) and Gaurav Bhatia (26th) put in best efforts to score a goal each to enable their team win. Abhinav (42nd) struck the lone goal for Doon. Sanjeev Javadi of Government Inter College, Maldevta, got the second place in the 800m boys’ (seniors) race. While in the girls’ event, Aarti of Government Inter College, Nalapani, Nidhi Bhatt of Government Inter College, Kargi, and Anju of Sri Guru Ram Rai College, Nehrugram, stood first, second and third, respectively. Several students and teachers participated enthusiastically in the event. The competition commenced with a cultural event presented by the students. Singles’ semifinals played between Hasan Mansoor and Rakesh has to be abandoned in the second set due to shortage of time. Hasan was leading in the first set with 29-26 and the second set was being played at the score of 27-16 with Hasan marching ahead. Doubles’ semifinals, which was to be held between duo of Neeraj Thapa and LB Gurung and pair of SS Mehra and SC Gairola, could also not be completed. Third match couldn’t be started today. Organisers said due to their work they couldn’t hold the matches today.